Local history wasn’t something taught at school but I did learn the origins of the name “Monivae”. Not during a history class, rather religious education. I attended Hamilton’s Monivae College, a Catholic secondary school. 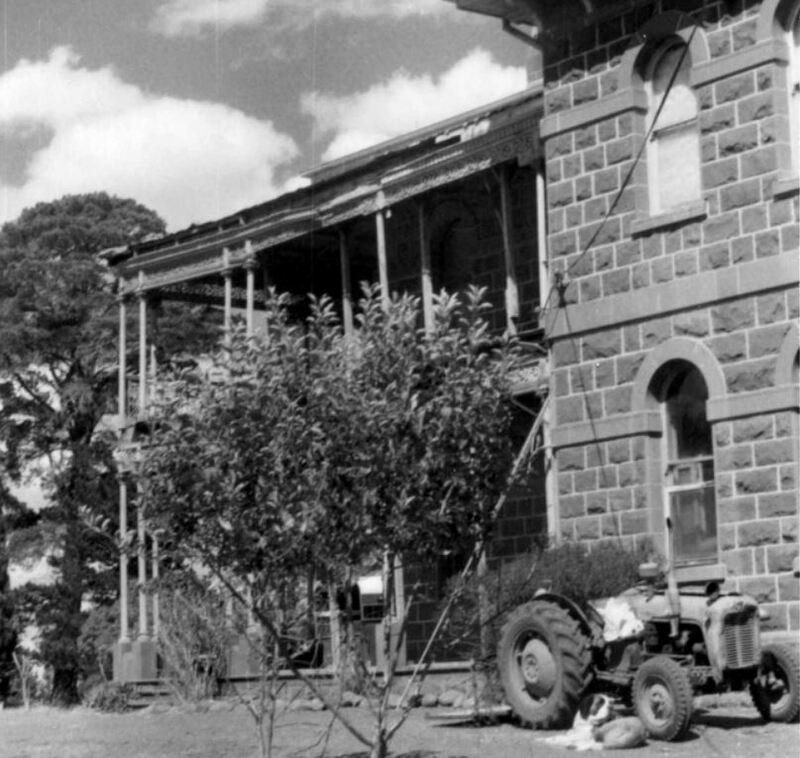 The college opened in the 1950s, on the Hamilton/Port Fairy Road, just south of Hamilton on a property with a two-storey bluestone homestead. 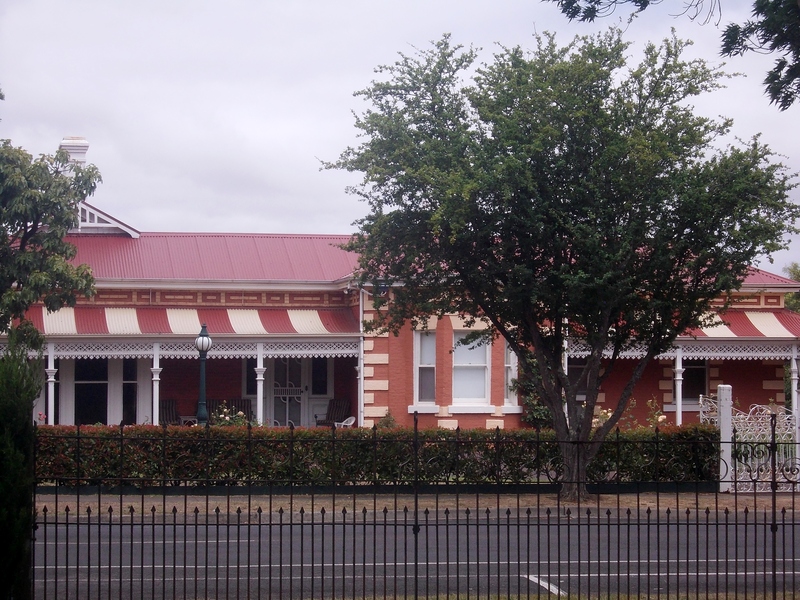 After the school relocated to Ballarat Road, Hamilton, the original property became known as “Old Monivae”. Those of similar age to myself, who didn’t sit through a Form 1 RE class at Monivae, could be excused for thinking the name started with the school. Instead, it goes back to an Irish Protestant by the name of Acheson Ffrench. Appointed as Police Magistrate in 1841 at Hamilton, then known as The Grange, Acheson Ffrench aged twenty-nine was from Monivea Castle, County Galway, Ireland, the Ffrench ancestral home dating back to the 1600s when the Ffrenchs took over from the O’Kellys. 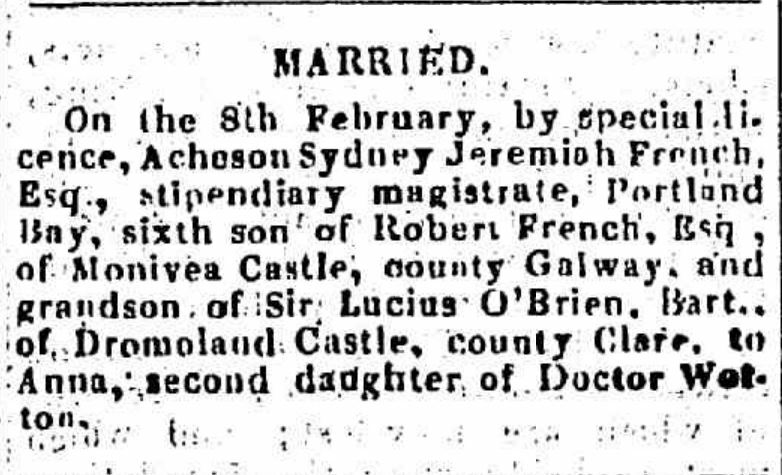 Born at the castle in 1812, the son of Robert Ffrench and Nicola O’Brien was educated in Dublin, destined to join the clergy, but Acheson had questions. He left Ireland and went on a pilgrimage of sorts through Europe and the Holy Land before landing in Australia. Don Garden in Hamilton, A Western District History, cites C. J. Griffith who met Ffrench in Melbourne soon after his arrival. Griffith recalled Ffrench’s tattoos, Jerusalem Arms inked by a monk in the ancient city along with various Arabic characters. “Government Gazette.” Australasian Chronicle (Sydney, NSW : 1839 – 1843) 8 July 1841: 4. Web. 14 Oct 2017 <http://nla.gov.au/nla.news-article31732227&gt;. 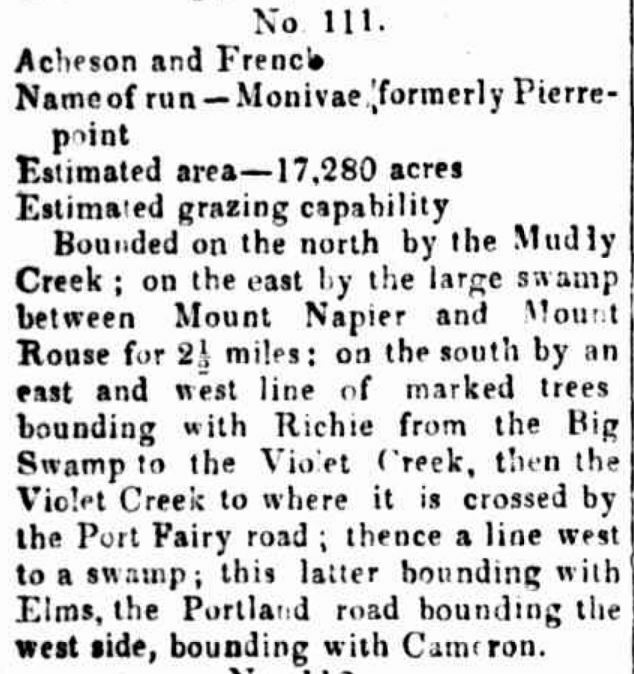 It was also 1841 when Ffrench took up land, a large run of 17,000 acres to the south of The Grange. He named it Monivae after his Galway home. It seems he never took on the original spelling of Monivea but Ffrench seemed fairly flexible in that respect. He dropped a letter from his surname, signing letters to the newspapers, of which he wrote many, as A.French. The Ffrench surname had already evolved back in Ireland from ffrench. “Advertising” The Melbourne Daily News (Vic. : 1848 – 1851) 1 February 1849: 4. Web. 14 Oct 2017 <http://nla.gov.au/nla.news-article226472923&gt;. On 8 February 1842, Ffrench married his fiancé Anna Watton, a daughter of Dr John Watton who in that year became Medical Officer at the Mt Rouse Aboriginal Protectorate. Acheson and Anna lived at the Police Magistrate’s residence on a site selected by Acheson on the corner of Thompson and Martin streets. The Hamilton Police Station and Courthouse still stand there today. “Family Notices” Geelong Advertiser (Vic. : 1840 – 1845) 14 February 1842: 3. Web. 14 Oct 2017 <http://nla.gov.au/nla.news-article92679898&gt;. By the end of 1843, the role of Police Magistrate was abolished and Ffrench was without a job. However, by February 1844, the government announced a new commission intended to keep the peace and Ffrench was named as a commissioner. He was able to stay on in at his residence but with reduced employment, Ffrench turned to improving Monivae and running sheep. 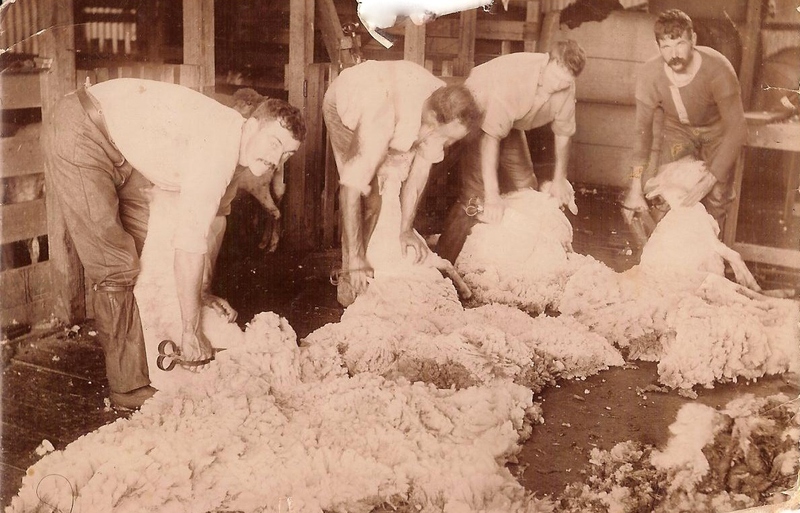 The Ffrench offspring were arriving at a steady rate and in 1847, a homestead was built at Monivae on what is now the eastern side of the Hamilton/Port Fairy Road. Anna would bear twelve children in all, six boys and six girls, with one dying as a baby. Acheson Ffrench wasn’t the best of farmers and money problems arose. In 1864, he put Monivae up for lease for a term of three years and moved the family to Melbourne. “Advertising” The Argus (Melbourne, Vic. : 1848 – 1957) 29 January 1864: 8. Web. 18 Oct 2017 <http://nla.gov.au/nla.news-article5743286&gt;. 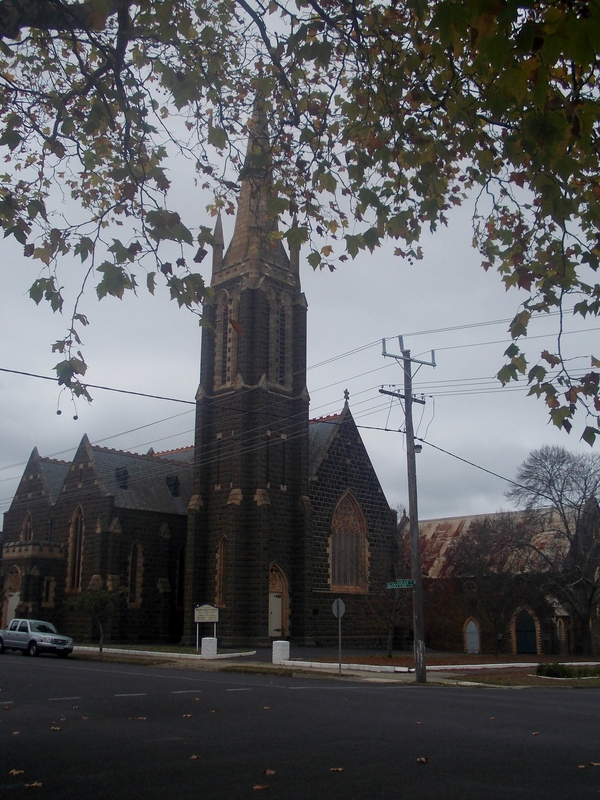 The family spent two years in Melbourne, returning to Monivae in 1866. Ffrench’s trips to Melbourne continued and he was there on 29 January 1870. He fancied a dip at Kenny’s Gentleman’s Bathing Ship (below) at St Kilda. With his arms reportedly by his side, Ffrench described as, “somewhat heavy with a stout build”, dived into the water from one of the diving boards. Normally at a depth of six feet, the tide was out leaving the water depth at just over four feet. Ffrench hit his head on the bottom and unconscious when dragged out. He could not be revived, dying within minutes. An inquest found Acheson had broken his neck. Arising from the inquest was a conversation, of which Ffrench was a part in the days before his death. At lunch with friends, the topic of discussion turned to death from diving accidents. When news of Acheson Ffrench’s death reached Hamilton, shops closed as a mark of respect. He was remembered in the Hamilton Spectator, “…as generally very highly respected throughout the district for his strict integrity and manliness of character, whilst there was a certain rugged independence about him which led him to adhere strictly to his own convictions, without, however, attempting to force his views upon others”. Monivae was placed on the market and Anna Ffrench and the children moved to Melbourne. “Advertising” The Argus (Melbourne, Vic. : 1848 – 1957) 9 August 1870: 3. Web. 14 Oct 2017 <http://nla.gov.au/nla.news-article5828208&gt;. Ownership of Monivae transferred from an Irishman the Spectator described as having “peculiar” religious views, to a staunch Presbyterian from the Scottish Highlands. James Thomson and his wife Christian Armstrong arrived in Victoria in 1852 aboard the Europa. They spent around five years at the Clyde Company’s Golf Hill, near Shelford. 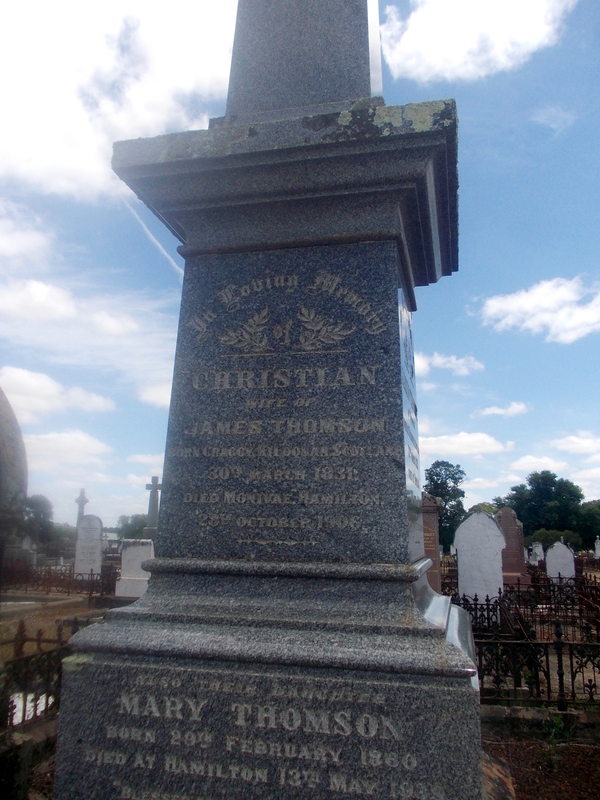 Their first child John was born in 1853 at neighbouring Warrambeen, home of Christian’s brother Alexander Armstrong. James Thomson then purchased an interest the Ullswater and Maryvale Stations near Edenhope and settled at the later property. By the time the Thomsons arrived at Monivae in 1870, they had seven children aged two to seventeen and they moved into Ffrench’s homestead. Over the next six years, the Thomson family continued to grow. In 1871, twins James and George were born followed by Wilhelmina Jessie in 1873. Sadly, Wilhelmina died on 5 April 1875. The last child born to the family was William Armstrong Thomson in September 1876. It was around the time of William’s birth, James Thomson decided they needed a bigger home or more correctly, a “mansion”. 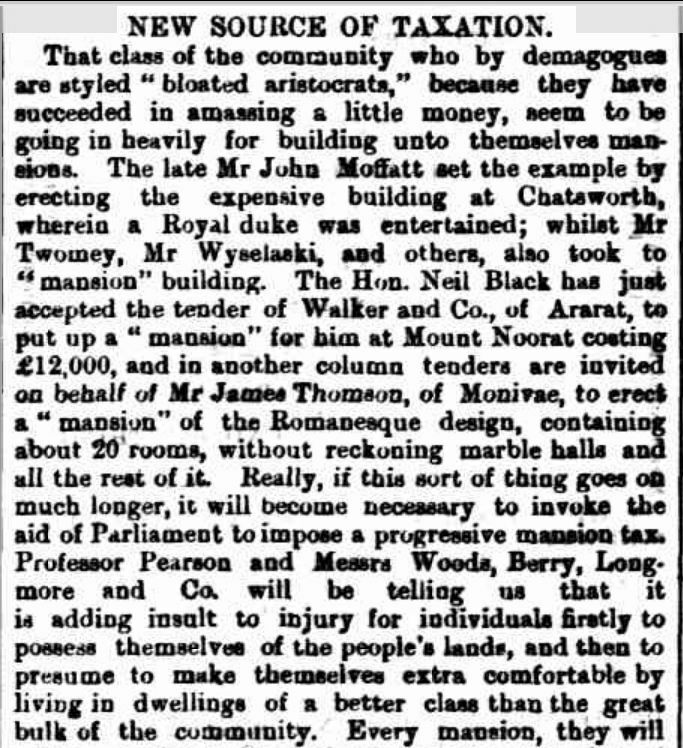 He wasn’t the only one and the “bloated aristocrats” were duly roasted by the Ballarat Star calling for a mansion tax. “NEW SOURCE OF TAXATION.” The Ballarat Star (Vic. : 1865 – 1924) 18 December 1876: 4. Web. 14 Oct 2017 <http://nla.gov.au/nla.news-article199833143&gt;. Some may believe, especially if they did Form 1 RE with me in the 1980s, the existing Monivae homestead was built by Acheson Ffrench. James Thomson was never mentioned in our classes. Likewise, Thomson was not mentioned in historian Margaret Kiddle’s book Men of Yesterday and she credited Ffrench for building Monivae “probably in the late sixties” (p.316). However, James Thomson was responsible for the Monivae Homestead we know today. The site for the new homestead was about 800 metres from the former homestead and on the other side of the Hamilton/Port Fairy Road. William Smith, the Borough Surveyor drew up plans, tenders opened and using bluestone sourced from the quarry on the property, construction began. Thomson’s total expenditure was £5400 something he likely regretted because the government did introduce a “class” tax and if the timing was slightly different, the homestead may never have been built. The land tax, introduced in the colony in 1877, intended to break up large holdings such as Monivae and it was thought Thomson would never have gone ahead had it come earlier. 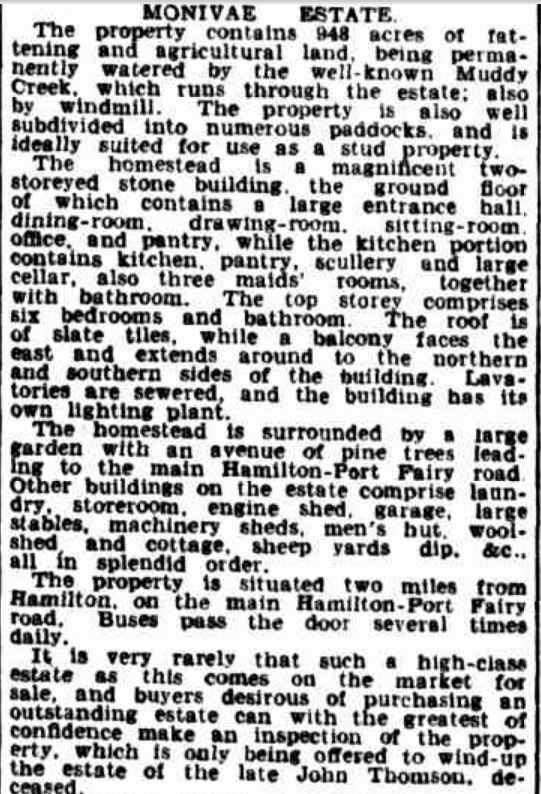 A Hamilton Spectator correspondent toured the new sixteen roomed homestead in May 1878. Critical of the external appearance he suggested “one of those elegant lookout towers” to improve the looks. He remarked it might be an addition “when times – politically speaking – improve”. A tower was never added and reforms to the land tax didn’t come until 1884. The lacework and coloured tiles of the verandah did meet approval. As the correspondent entered the front door, a hallway measuring twenty-four feet by ten feet wide was before him with, “white walls, shining like so much marble would perhaps give it too cold a look; but for the coloured light thrown into it, from the staircase and front door windows, and its mosaic pavement formed of Minton’s tiles.” The drawing room was around twenty-six feet by sixteen feet but for special occasions, folding doors into the breakfast room could open. The floor space then increased to forty-six feet, allowing for dancing. The homestead boasted an eighteen-foot tiled staircase with a cedar railing leading to the upper storey with a balcony verandah around ten feet wide and 130 feet long. Paved in coloured tiles, it was perfect for the Thomson children to roller skate. That was until 1887 when sixteen-year-old James Thomas Thomson skated straight over the railing onto the gravel about nine metres below. He fractured his skull and although it was touch and go for a few days, he made a full recovery. His twin George, known as “Joe” was not so lucky. Having suffered congenital heart problems, he died suddenly two years late on 4 June 1889, at Monivae aged eighteen. The Thomson children were not the marrying kind. Of the five Thomson girls, three married, as did three of the surviving four boys. None married before the age of twenty-seven and John was fifty-six. The first Thomson wedding was that of thirty-year-old Annie Thomson to James Allan Learmonth, son of Hamilton businessman and grazier Peter Learmonth and Mary Jarvey Pearson of Prestonholme. 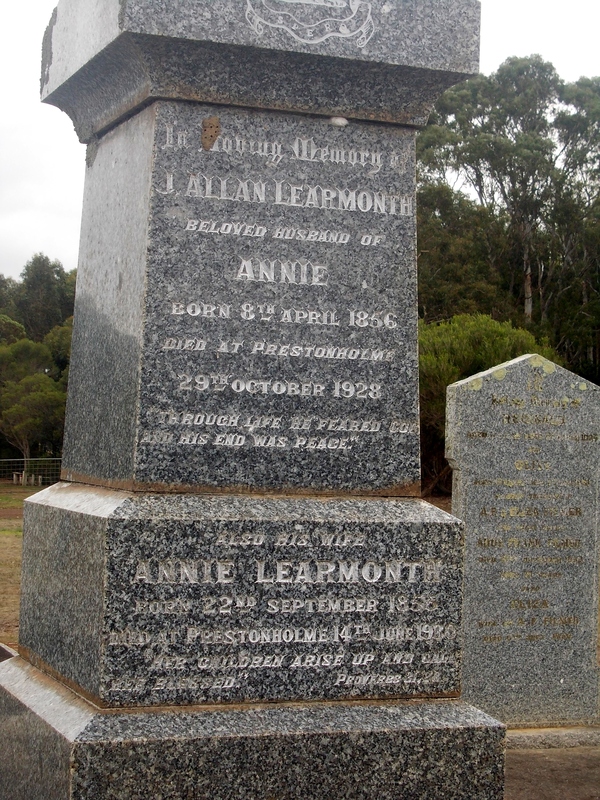 Learmonth was also a devout Methodist, a pillar of the Hamilton Wesleyan Church in McIntyre Street. It was the grandest of the three weddings James Thompson would pay for. Celebrated on 1 September 1886, at St Andrew’s Presbyterian Church Hamilton, the marriage was not followed by the usual wedding breakfast. Instead, two weeks later James threw a private ball for two hundred guests in the Hamilton Town Hall for the newlyweds in lieu of a wedding breakfast. Such a grand affair may have been due to Annie’s imminent departure for Mexico with her new husband who’d been managing the family property there. It could also have been the thinking of a canny Scot. Why pay for both a wedding breakfast and a send-off when one event will suffice. On 3 October 1888, it was Margaret “Maggie” Thomson’s turn to marry. She too had reached the age of thirty and opted for a small quiet gathering at Monivae. The groom was Thomas Haliburton Laidlaw, son of Thomas Laidlaw and Grace McLeod and those in attendance were mostly family. Elizabeth “Lizzie” Thomson married on 27 July 1893 in the drawing room at Monivae, again a quiet celebration. Her groom was bank manager Forrester Goldsmith Armstrong, a son of Oliver Armstrong of Kyneton. By this time Lizzie’s older sister Annie and her family were home from Mexico to witness the occasion. Fire has threatened the Monviae homestead many times since its construction including 1891, 1944 and more recently Ash Wednesday of 1983. The fires of February 1901 were particularly fierce and practically wiped out Byaduk North a little further south. 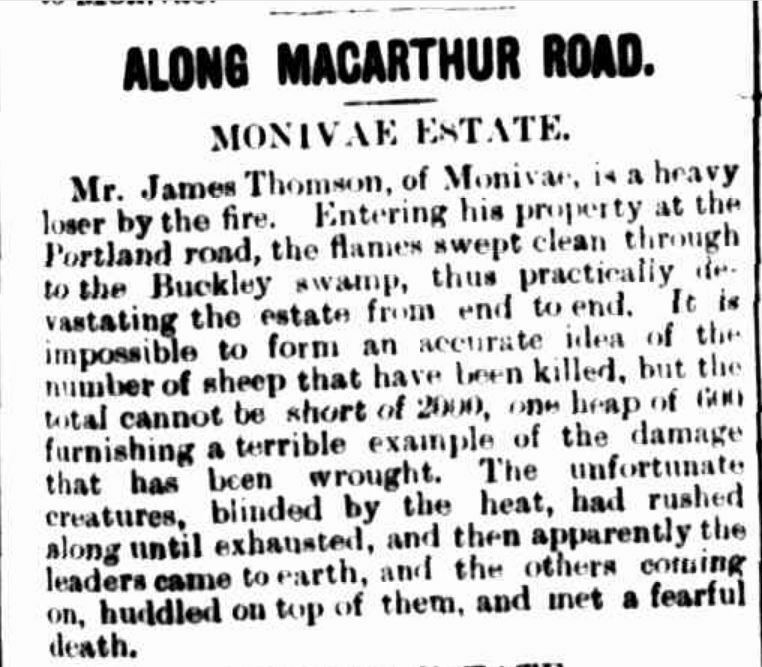 At Monivae, fire swept through the property from one end to the other killing around 2000 sheep. In 1906, the Victorian Government received an offer to buy 17,000 acres of the Monivae Estate from James Thomson for Closer Settlement. He would keep 3,000 acres and the homestead. Negotiations with the government broke down, so James subdivided the land himself. 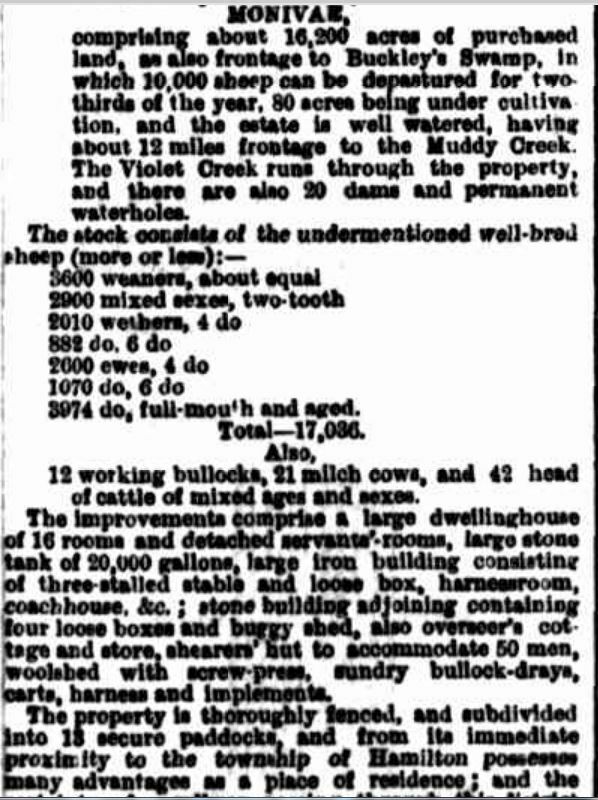 An initial sale on 24 November 1906 saw 322 acres auctioned. Of the lots sold they averaged around £16 per acre. A second sale was held on 20 December 1906 and 1022 acres were sold at an average of £9 13/ per acre. James also sold off Crawford Estate and subdivided 500 acres of Lake Condah Estate. With a downsized Monivae, youngest son William left the property and moved to Portland. Oldest son John stayed on at Monivae as did unmarried daughters Mary and Christina. The land sales came in the wake of a great loss for the Thomson family. On 8.20am on 24 October 1906 at Monivae, the matriarch of the family, Christian Thomson drew her last breath at the age of seventy-five. A deeply religious and charitable woman, she was one of the fundraising champions of the town and attended St Andrew’s Presbyterian Church like clockwork “morning and night”. Everyone knew her pew. A full member of the church for thirty-six years, her name was added to the church roll on 4 October 1870. Christian was also a member of the Ladies Benevolent Society and the British and Foreign Bible Society. She managed to attend church until just a couple of weeks before her death. Christian was buried at the Hamilton (Old) Cemetery. It was fourteen years between the weddings of Thomson children and it was James Thomas Thomson, the roller skater, who was next to take the plunge. He was living at Inverary, Branxholme by the time he married Henrietta Moynan on 26 November 1907 at the Anglican Christ Church Hamilton, the church sharing Church Hill with St. Andrew’s. The couple made their home at Inverary. By that time, some may have thought James’ older brother John who had hit his mid-fifties, would remain a bachelor but on 31 March 1909 at Lilydale, he married Christiana Robertson. Younger brother Alexander was close behind, marrying Ethel Manning on 6 May 1909. He was forty-six. Possibly the last public duty undertaken by James Thomson of Monivae was the laying of a foundation stone for a new St. Andrew’s Presbyterian Church. A devout parishioner, James donated bluestone from the Monivae quarry for the new church. The ceremony took place on 18 December 1907 with James just four months from his eighty-seventh birthday. 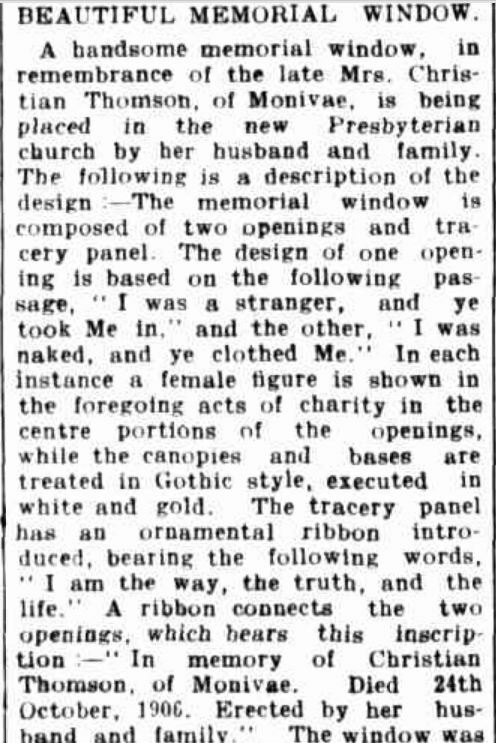 After completion of the new Presbyterian church, James donated a memorial window to remember his wife, Christian. Also, portraits of James and Christian and their children John and Margaret Thomson were unveiled at the church in 1918 along with those of seven other prominent Hamilton Presbyterians. “BEAUTIFUL MEMORIAL WINDOW.” Hamilton Spectator (Vic. : 1870 – 1918) 26 May 1909: 4. Web. 14 Oct 2017 <http://nla.gov.au/nla.news-article225037595&gt;. 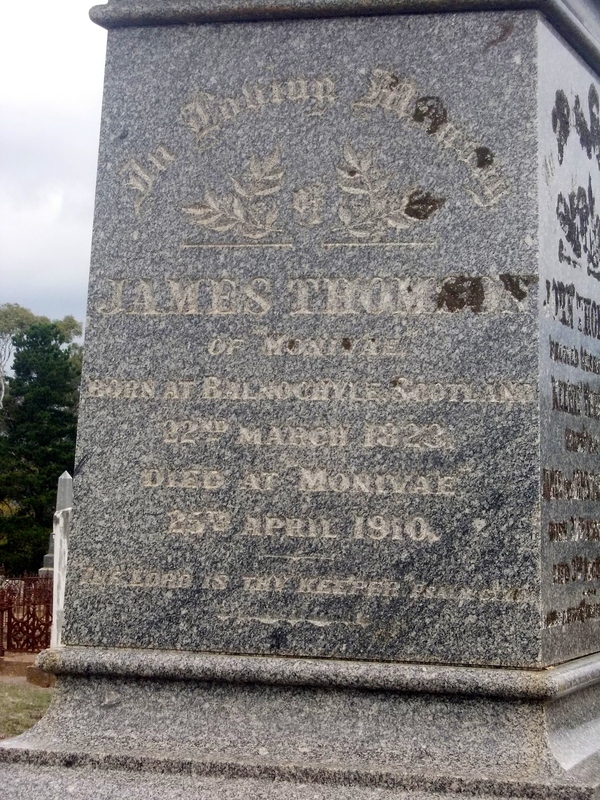 James Thomson died at Monivae on 25 April 1910 after an illness of two weeks. His obituary described him as, “…a man of sterling qualities and simple tastes. Never courting publicity, he was never so happy as when surrounded by children or occupying himself in his garden”. 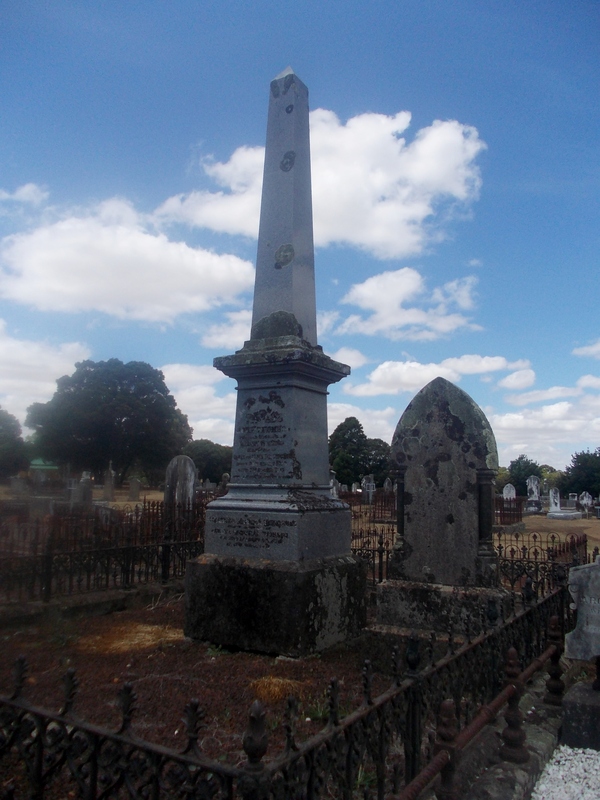 James left Monivae for the last time at 2.30pm on Wednesday 27 April 1910 for the Hamilton (Old) Cemetery. James Thomson’s probate file reveals his liabilities were £814. His debts included rates, wages to a number of Monivae staff and accounts with businesses in Hamilton. The total of the estate was £36,209. Of that, over £2600 was stock including several thousand sheep. Another £300 was the furniture filling the rooms of the homestead. The Monivae property including the homestead was valued at £25000. By that time, the homestead Ffrench built was accommodation for Monivae workers. James bequeathed two-thirds of his estate to his four living sons, divided equally. To his five daughters, James bequeathed one-third of his estate in equal shares. Eldest son John Thomson was given the first option to buy the property at a value of £8 per acre. He could also buy the farm implements and furniture in the homestead for £400. The last of the Lake Condah Estate was sold as too a large amount of stock. Extra funds were no doubt wanted to pay the duty on the estate totalling more than £2500, seven percent of the total. John Thomson did take up the option to buy Monivae. He was around fifty-seven and newly married to Christina “Keenie” Robertson, a daughter of Scot James Robertson and Jane Ritchie of Keilor. Christina herself was forty-three and children were not in the equation. Like his parents, John was a stalwart of the Presbyterian Church and on the board of management of St Andrew’s for thirty years. As well as running Monivae, John was a politician and by 1910, had held the seat of Dundas in Victoria’s Legislative Assembly for eighteen years across two terms and was a Honourary Minster in the Cabinet. “THE OPENING OF THE THIRD FEDERAL PARLIAMENT.” Weekly Times (Melbourne, Vic. : 1869 – 1954) 2 March 1907: 9. Web. 13 Oct 2017 <http://nla.gov.au/nla.news-article221256443&gt;. 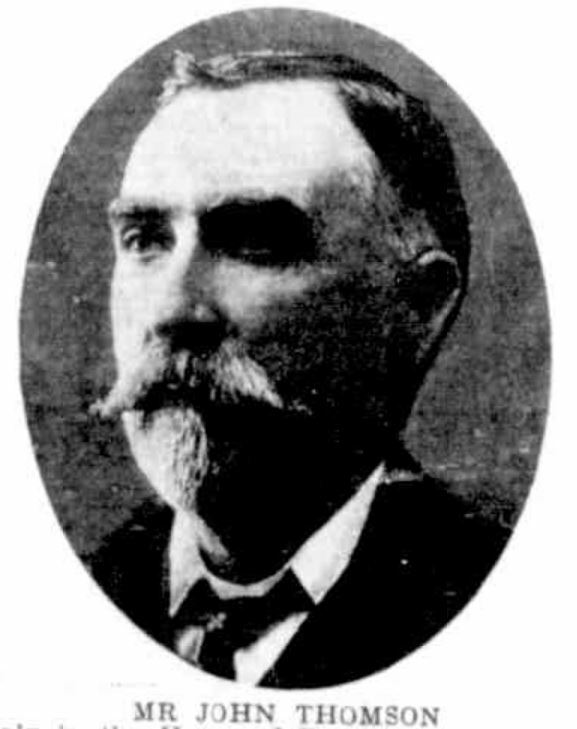 In May 1914, John Thomson announced after twenty-two years in the seat of Dundas, he would not stand for re-election at the forthcoming State Election. The reasons given were the need to spend more time at home with his wife and to tend to other family matters. He said the last five years were extremely busy ones and he was looking forward to leading a quieter life. John’s unmarried sisters Christina and Mary had stayed on at Monivae after their father’s death. In 1914 and feeling under the weather, Christina then aged forty-six attended the doctor on Friday 6 November but managed to take up her usual place at St Andrew’s the following Sunday. She died suddenly about midday at Monivae on Monday 9 November with Mary at her side. Well-liked in the community, Christina like her mother was devout and charitable. It was around the time of Christina’s death, the Monivae State School opened on the Portland Road. With Closer Settlement in the district and James’ subdivision of Monivae, the area was becoming increasingly populated. The school eventually closed and in 1946, the school building was moved to the North Hamilton State School. John Thomson spent the years after his political retirement maintaining Monivae and was involved with various committees and activities in the Hamilton district. He made a trip to Melbourne on 3 August 1917 and attended a school football match with Archibald Simpson of Clifton, Hamilton. The funeral for John Thomson was large with condolences and floral tributes sent from dignitaries across Victoria. His coffin bearers were Monivae employees and members of the Hamilton Angling Club. 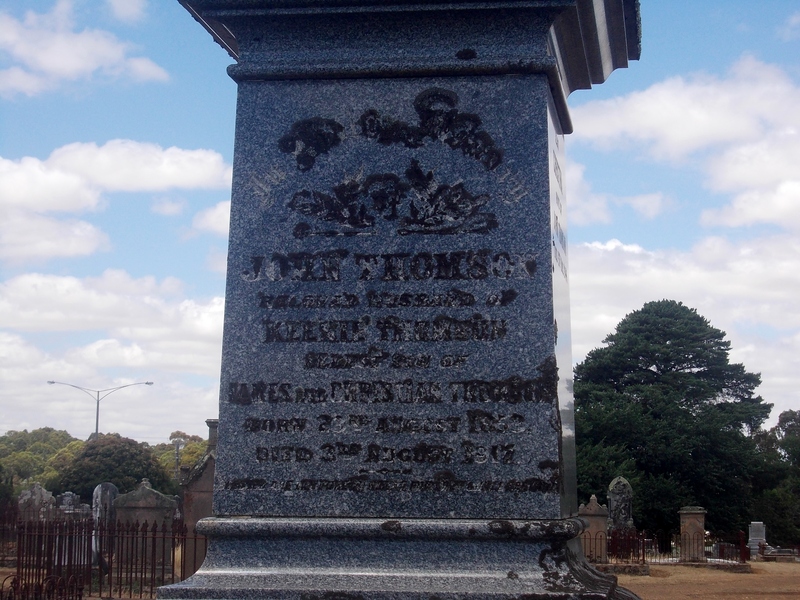 John was buried in the Thomson family plot at the Hamilton (Old) Cemetery as the Hamilton Brass Band played “Nearer My God to Thee”. John left his estate valued at over £46,000 to his wife Christina and brother-in-law Thomas Laidlaw. Upon Christina’s death, the estate would be divided between John’s brothers and sisters. One of John’s more interesting investments was 500 shares in the Melbourne Ice Skating Company. The estate was held in trust and Christina moved to Sandringham in 1921. She died at Toorak in December 1949 at the age of seventy-nine. Alexander, the second eldest son of James and Christian Thomson took over the running of Monivae. Alexander and his wife Ethel Manning and their two children Kathleen Mary and James Yelverton Monivae Thomson moved into the homestead. 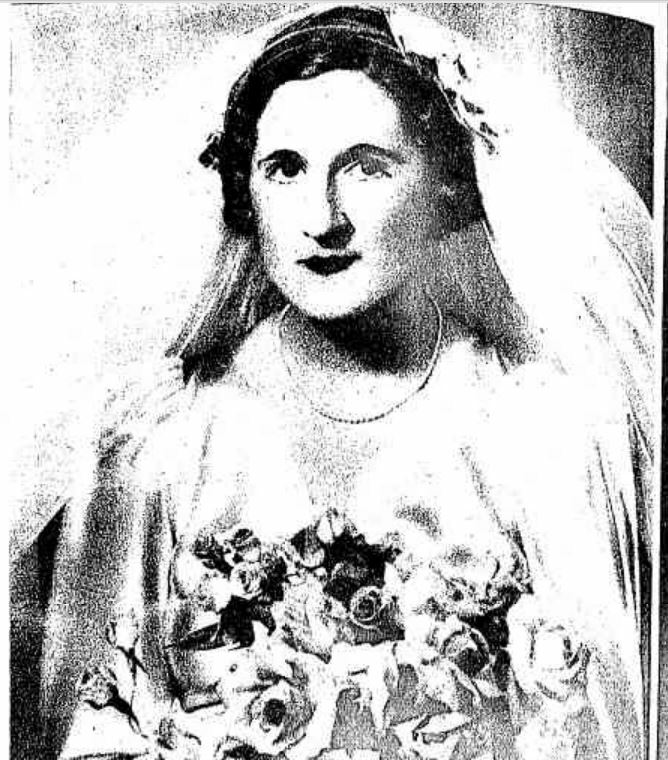 Kathleen (below) married Hugh Lloyd Cameron of Geelong at St. Andrew’s Presbyterian Church, Hamilton on 18 February 1937. The 1930s saw the death of five of the Thomson siblings. Annie died on 14 June 1930 at Prestonholme aged sixty-four leaving six children, Edgar, Russell, Keith, Christina (Mrs James Young), Maggie (Mrs Alex Armstrong), and Mona Learmonth. Having married the son of Hamilton’s leading Methodist, Annie changed her allegiances and was active in within her new church. A memorial window (below) was installed in the Hamilton Wesleyan Methodist Church remembering Annie and her husband James Learmonth. 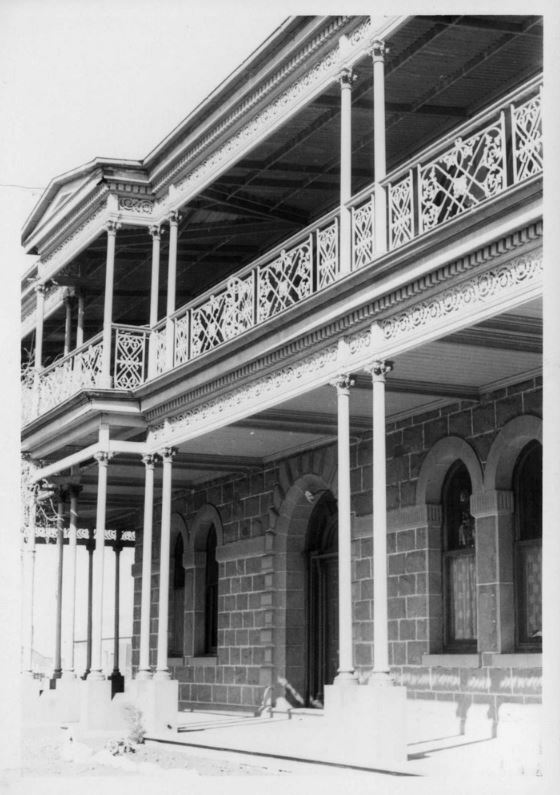 Margaret died on 30 December 1932 at her home Kilora (below) in Kennedy Street, Hamilton. She left six children, Hal, John, Alexander, Thomas, Gretta (Mrs Lance Lewis) and Bea (Mrs John McKellar) Laidlaw. On 23 March 1933, Elizabeth died at Corra, Willaura, the home of her son-in-law Donald Moffatt leaving two children Vera and Pat. 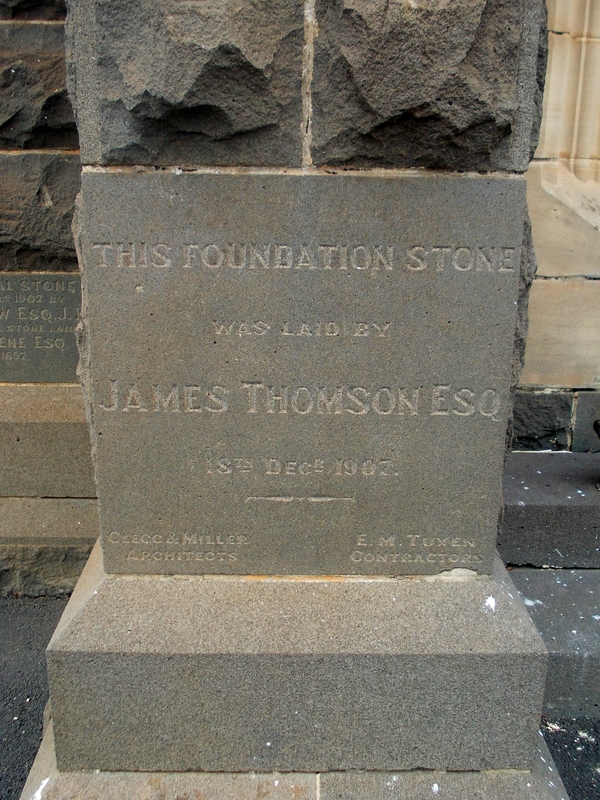 James Thompson Jr. died in 1934. He and Henrietta did not have children. Youngest son William, who never married, died on 2 May 1943 aged sixty-six at Portland. His body was taken to Monivae before leaving for the Hamilton Cemetery. After the death of her sister Christina, unmarried Mary Thomson spent time in Malvern living with her sister Elizabeth. 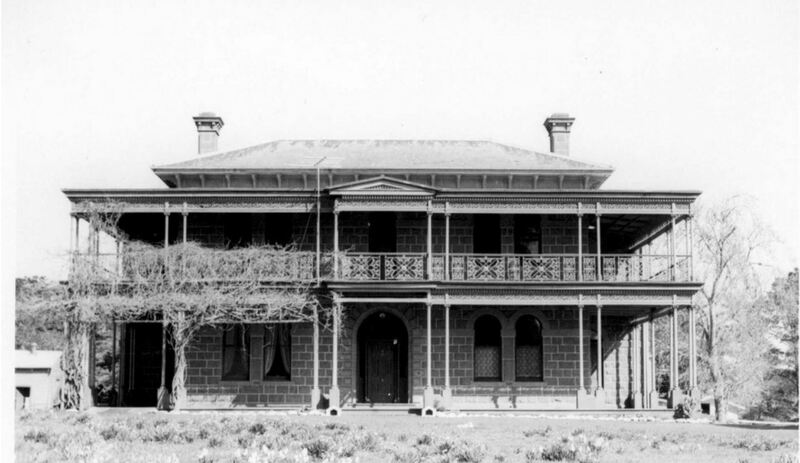 After Elizabeth died, Mary moved into Kilora (below), sharing the home with her widower brother-in-law Thomas Laidlaw, husband of Margaret Thomson, until her death on 13 May 1939. Thomas Laidlaw died in 1941. Alexander Thomson’s death in June 1946 aged eighty-three, brought to a close the lives of the children of James and Christian Thomson. Sixteen of their grandchildren and their children remained. Like his siblings, Alexander was buried in the Thomson plot at the Hamilton (Old) Cemetery (below). After seventy-seven years, with the estate of John Thomson requiring closure, Monivae in the Parish of Monivae in the County of Normanby went up for sale. “Advertising” The Argus (Melbourne, Vic. : 1848 – 1957) 28 December 1946: 18. Web. 16 Oct 2017 <http://nla.gov.au/nla.news-article22384820&gt;. 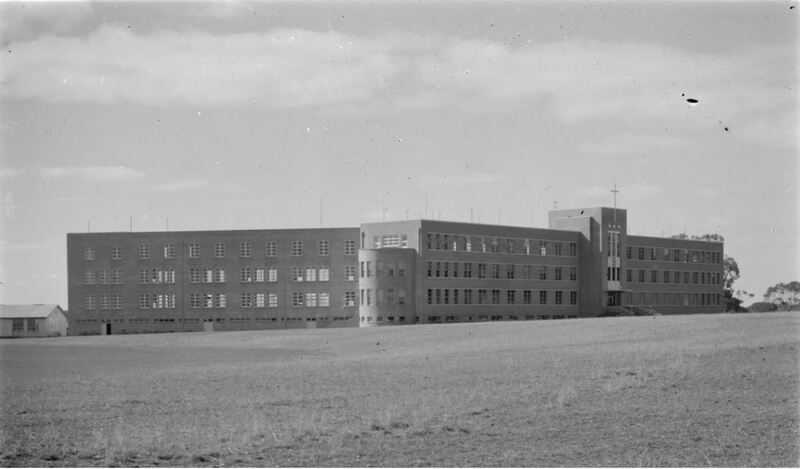 The Catholic order of the Missionaries of the Sacred Heart (MSC) was looking for a new site for a boys’ boarding college after establishing a school in Toowoomba, Queensland sixteen years earlier. The Monivae homestead was purchased in 1947 with grand plans of developing the property into a school. 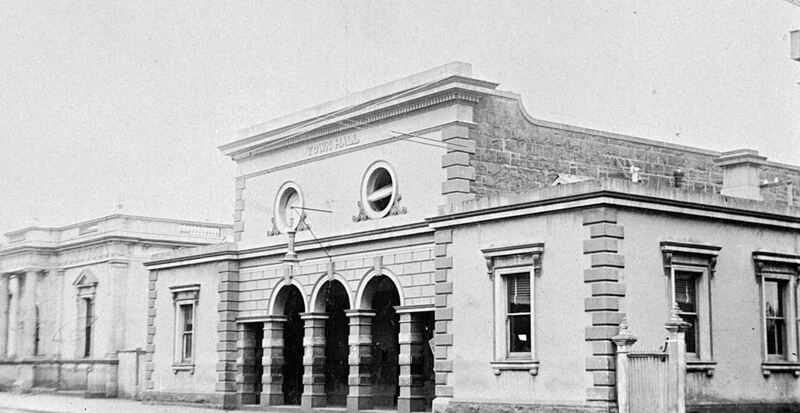 “M.S C. BOYS’ COLLEGE FOR HAMILTON” Advocate (Melbourne, Vic. : 1868 – 1954) 13 August 1947: 7. Web. 16 Oct 2017 <http://nla.gov.au/nla.news-article172490068&gt;. It soon became clear, the site was not suitable and the MSC went in search of a new site. Bob Strachan owned land on Ballarat Road, Hamilton and the MSC were able to negotiate a trade with him. The MSC obtained the land in Ballarat Road for the new school and retained 100 acres at Monivae including the homestead. Bob Strachan’s side of the bargain was the balance of the Monivae property. A day school in temporary buildings on the Monivae property started in February 1954 while the new school was under construction. On 17 October 1954, the foundation stone for the Ballarat Road school was blessed. The contract for the building which started in mid-1953 was the largest seen in Hamilton, estimated at £250,000. Classes started at the new school in 1956 despite it being far from complete. Monivae College not only adopted the name of the Ffrench named property, the school’s badge includes a reminder of Ffrench’s heritage, two Dolphins also part of the Ffrench family crest. MONIVAE COLLEGE, BALLARAT ROAD, HAMILTON c1956. From 1841, religion was at the forefront at Monivae. From Acheson Ffrench questioning and challenging his faith to the Thomson’s unwavering devotion, to the arrival of the priests of the Missionaries of the Sacred Heart. The Monivae College motto Fortes in Fide meaning Strong in Faith could easily have been the Thomson’s motto too. The Monivae homestead became rundown and was later taken over by Glenelg Region Water, now known as Wannon Water. The homestead and what remains of the surrounding Monivae property has since returned to private ownership and has undergone extensive restoration. Monivae will be open on Sunday 22 October from 10am to 4pm. All proceeds go to another of Hamilton’s historic jewels the Hamilton Botanic Gardens and its ongoing redevelopment. 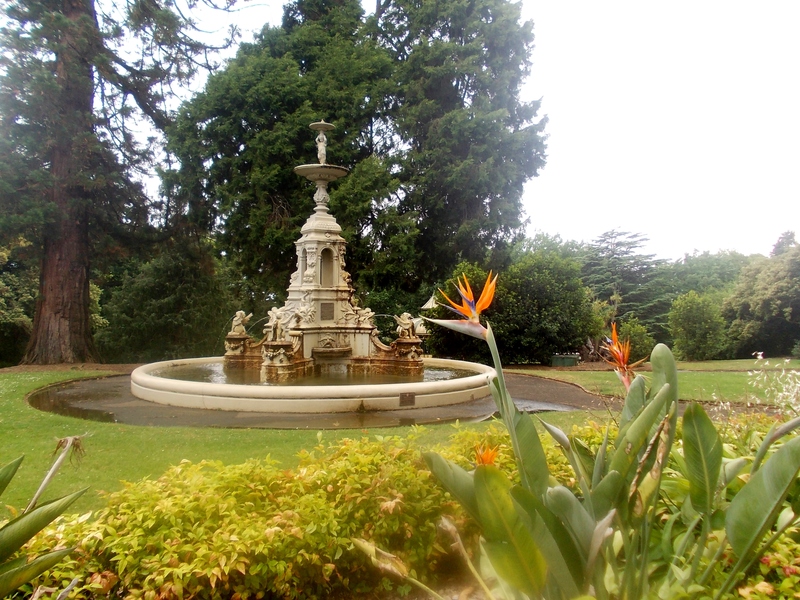 Appropriate as a feature of the gardens is the beautiful John Thomson Memorial Fountain. Such was the high regard for John Thomson of Monivae around the Hamilton district, the fountain was built in his memory and unveiled in April 1919 by the then Premier of Victoria. In its position, the fountain is visible from the front gates of Kilora in Kennedy Street, acting as a constant reminder of their dear brother John for sisters Margaret and Mary Thomson during their time at the home. This entry was posted in Western District History and tagged Armstrong, Ffrench, Hamilton, Hamilton Botanic Gardens, Laidlaw, Learmonth, Monivae, Thomson. Bookmark the permalink. Loved the recent post and see that the stained glass window was a work by E.L. Yencken & Co. One small fix if I may. The Trove link to the article about the window fails as it includes ‘&gt’ on the end of the URL which needs to be removed. Don’t publish this as a comment on the post . Just delete it.